Tonights openers, Sanctum, were pretty unmemorable. Too much noise, not enough music. Area 54 were much as they were when I saw them earlier in the month. Perhaps not as strong a performance, but good enough, and the drummer didn't seem so out of place tonight either. And so on to Blaze. I have to say that I was appalled by the size of the crowd. The Underworld is not a large venue, yet it was all but empty tonight. If rock fans can't be bothered to come out and support bands, then the bands will simply stop playing here. What's even more surprising is that Blaze is touring on the back of a very strong solo album, and even without the support of the British rock press, I'd have expected more people. 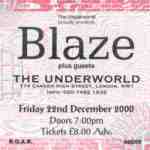 Still, it's their loss because Blaze put on a really great show, particularly when you take into account the lack of atmosphere due to the emptiness of the venue. He seems to be enjoying himself as a solo artist, and I think he's better off out of Iron Maiden, even if he'll probably miss the commercial success that he had before. Hell, he even managed to turn "Como estas amigos" into a good song live, and that's probably one of the weakest tracks Maiden have done in years. Great songs, great performance, it's just a shame about the audience. Not only was it a great show, but he even brought Steve Harris on for "Man on the edge" during the encore. Originally, the support tonight was going to be Overkill (not Everkill, as incorrectly printed on the tickets). 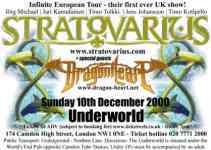 However, they had to pull out due to financial difficulties, so DragonHeart were called in at the last minute. I'd bought the DragonHeart CD a few months earlier, and although I was quite impressed by it, it was lacking that spark that separates the competant from the truly great. Live, however, that spark was present in buckets. If they can find a way to capture the energy of their live show in the studio, they have a very bright future ahead of them. Tonight, they were absolutely stunning. Rob Halford is starting to look old, but his voice is still in fine form. He played a varied selection from his excellent new album, a couple of tracks from his Fight days, and of course some Priest tracks. I didn't feel his vocals were mixed high enough at times, but it wasn't bad enough to be a real problem. I was slightly disappointed with the Priest tracks he chose (for example, I feel "Tyrant" to be one of their weaker offerings), but no doubt there were others who wouldn't have been happy had he chosen others. That said, there were some great choices, too  "Jawbreaker", "The Hellion / Electric Eye" and "Beyond The Realms Of Death", for example. The first encore (of a total of 5, I think!) was "Breaking The Law", sung entirely without a microphone, effectively turning it into a great crowd participation exercise. The highlight, however, was the final encore. There had been rumours that Halford were going to be joined on stage by Bruce Dickinson and Dave Mustaine. In actual fact, we got Bruce Dickinson and Geoff Tate. Three of the greatest metal vocalists of all time sharing the same stage  what more can anyone ask for? My first trip to Whitby, and although the other activites over the weekend were very good, it was the strong lineup of bands that persuaded me to go. On the Friday, things started out well with Emma Conquest, who put in a good, solid performance. Next came Inkubus Sukkubus, who were pretty much as you'd expect. Their performances tend to be very similar, but sometimes it works better than others. Tonight was one of the times when it worked, and even if they've been better before, they came across well tonight. The Saturday kicked off with the only band I hadn't heard of before. I try to have an open mind when confronted with an unfamiliar support band, but I'm almost invariably disappointed. Mist Of Avalon proved to be the rare exception, and they put in a very strong performance, enough to persuade me to buy the CD. Next up were Screaming Dead, who I've seem often enough to know that I really don't like them that much, so I sat that one out in the bar. Finally, Clan Of Xymox put on another solid performance. I don't know what it is about Xymox, but they just don't seem to excite me that much. They have all the right ingredients, and on paper, I should really get on with them, but live, they just seem a bit too bland. It's not that they're bad, it's just that they fail to stand out. Highlight of the weekend, then, was Mist Of Avalon -- an unexpected suprise, and I look forward to hearing more from them. The first band, Swarf, were a real surprise. Very impressive for a support band, and definitely one to watch out for in the future. Although I'd heard Passion Play before, they didn't really pull it off live, and weren't particularly memorable. And so on to the headliners Manuskript, who put in an excellent performance. If there's any justice in this world, Manuskript will be heading on to bigger and better things. 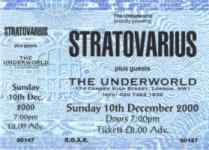 Another gig where there was either no support or they were so unmemorable that I can't remember them. Alice Cooper, on the other hand seems to get better every time I see him. This tour was on the back of his Brutal Planet album, a good album albeit not his best. The stage show was excellent, and Alice's vocals were as good as they've ever been. The first band, Sulpher, were very good, although I'd prefer them to have cleaner vocals. One to watch out for in the future, though. Sneaky Bat Machine, on the other hand, were that particular brand of "nu-goth" that bears little resemblence to anything vaguely goth. It's just dance music, and really doesn't belong here. Third up were Killing Miranda, who were good, but sadly plagued by technical problems. As a result, they cut their set short, although they did manage to play a reasonable smattering of songs first. 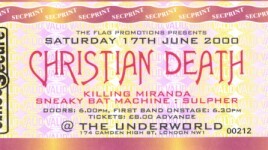 Finally, headliners Christian Death, who were sadly crap. I've never really liked their earlier material, but some of their newer stuff is much better. Unfortunately, I couldn't recognise any of the newer stuff, and on the whole, I'd sum them up in one word: awful. This was the first of a two date celebration of the 20th anniversary of NWOBHM, the New Wave Of British Heavy Metal. Due to a family bereavement, openers Praying Mantis didn't show up, but that had the side effect of allowing Angel Witch to do a longer set. Since they were the band I was primarily there to see anyway, I wasn't too bothered by the absence of Praying Mantis, although it would have been nice to see them. I hadn't actually heard any Angel Witch for about 10 years before this gig, and so I wasn't entirely sure what to expect. They appear to be one of the few bands that are getting heavier with age, and the performance was very powerful and impressive. Of the tracks I remembered (probably about a third of what they played), the highlights were "White Witch" and obviously "Angel Witch". Oh, and the fact that they're the only band I'm aware of that have a Klingon playing bass :-) The only downside, as has always been the case, is that Kevin Heybourne just doesn't have a good enough voice to front a band like this. This was the fourth time I'd seen Dirty Deeds, and this was probably the weakest I've seen them. That's not to say they put on a bad show -- far from it. It's just that I think they've been better in the past. As for Great White, I was surprised at how popular they are. I'm so used to going to see bands in half filled venues, but tonight the Underworld was completely packed, and they obviously reacted well to that -- any band tends to play better to an appreciative audience. The only downside was a long and rather dull Led Zeppelin / Jimi Hendrix interlude in the middle. The bass player was very impressive, though. I wasn't even aware that there was going to be a support for this gig, and when they arrived on stage, I managed to miss them announcing who they were. I was later told that they were Downward Thing. They were musically competent, but the singer was way too monotonous for my liking. If he'd learn to vary his voice slightly, they'd be a much more interesting band. As it is, they're just too bland. Although I like Lacuna Coil, I wasn't expecting a great show, merely something good. Fortunately, I was mistaken. They were very impressive, and the songs had a bit more bite than I had remembered. Highlight of the evening was probably "Cold", the track that first intriduced me to the band, but to be honest, they didn't put a foot wrong all night, and I couldn't fault any of the songs. I'll be seeing them again when they return to the UK. Openers K-Nitrate got the evening off to a bad start by basically being crap. Fortunately, Angelwhore put things back on track, with a fairly strong set. While I'd heard Killing Miranda before, I'd obviously not heard many representative tracks, and was somewhat indifferent to them. Live, however, they were very, very good. I'd recommend them to those that like that sort of music, and I'd certainly go and see them again. Rainmaker 888 started the evening off well, with a good, if very short set. Next up was Grave Digger. Although I like U.D.O., I was really there to see Grave Digger and they didn't disappoint. Every heavy metal stereotype you can think of was up there on stage, right down to the Judas Priest style studded leather outfits, and it was utterly, utterly awesome. I only wish they'd played some material from "Tunes Of War". U.D.O. were always going to have a hard time following that, at least in my eyes. Given that, they did surprisingly well, and I bought their latest album on the strength of their performance. Udo's voice still grates a bit, even if it has mellowed with age. Sadly, three members of the crowd saw fit to try and bounce off the rest of the crowd, knocking them to the floor, but other than that, a superb evening.